Your Summertime Guide to Outdoor Dining in Alpena! Summertime….and the living is easy in your Sanctuary of the Great Lakes! Nothing like relaxing on the patio with some yummy eats and a cold beverage! Want to skip the effort and mess of DIY? 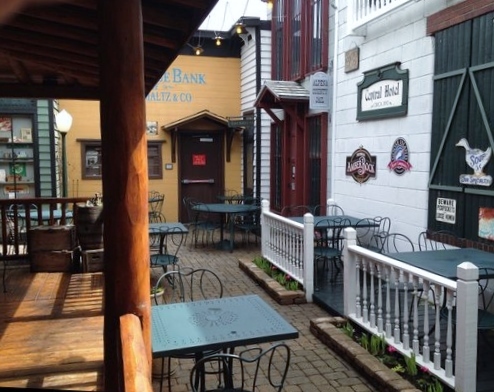 Here are some great spots for outdoor dining in Alpena: Sanctuary of the Great Lakes! The Fresh Palate- serves up a chef-created menu healthy and fresh in downtown Alpena. Hungry Hippie– providing fun healthy options with a front row view of Lake Huron, currently open inside of the Alpena Mall until May. John A. Lau Saloon- offers a courtyard beer garden in a historic atmosphere. Nowicki’s Sausage Shoppe- serves up high quality, handmade specialty brats on a bun with a variety of toppings. Stoney Acres Winery- has recently expanded its menu to include gourmet appetizers! Thunder Bay Winery- offers prime outdoor seating in downtown Alpena- and you can order cuisine from the neighboring Fresh Palate! Mangos Tequila Bar- has a cute and quiet outdoor space in the Chisholm St. pocket park with a fantastic view of the ‘Make a Splash’ fish mural! Pompeyos- just constructed a brand new outdoor deck for patrons to enjoy Mexican cuisine along with a Lake Huron view. Churchill Pointe Inn- a beautiful restaurant and inn with outdoor seating that overlooks pristine Hubbard Lake. Austin Brothers Beer Company- enjoy your Michigan craft beer in the beautiful weather at Austin Bros. Unlucky Cat Cafe this food truck located in the parking lot of Lee’s Miniature Golf offers a unique mix of Asian Fusion, nitro coffee, bubble teas, and more with a stunning view of Lake Huron.